When new resources are added, their working times are entered in the Manage resource details dialog. These times serve as basis for your operations calendar. There are, however, planning scenarios that require deviations from this operations calendar, such as overtime hours, to avoid the missing of delivery dates, holidays, periods of illness, machine downtimes etc. 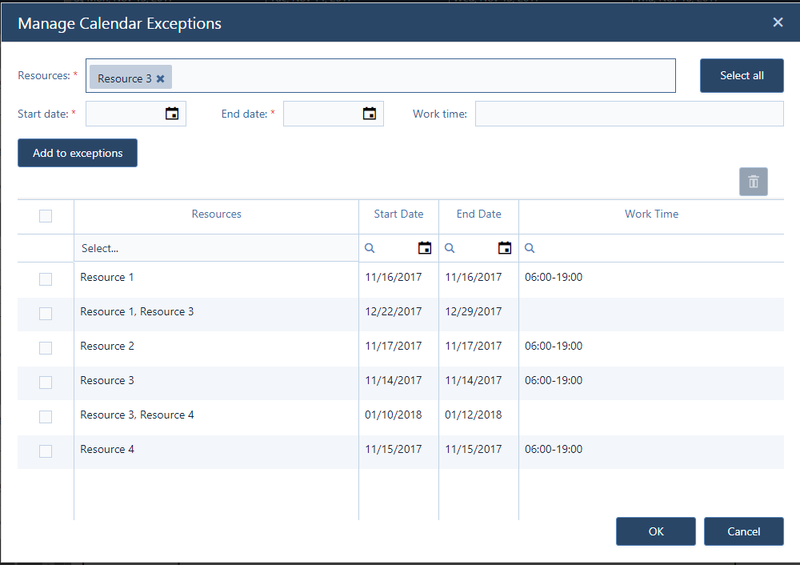 The chapter Create and edit resources and resource groups amongst others describes how to specify deviatons from the standard calendar for one certain selected resource. If you want to have an overview of all deviations for all resources or if you want to define several deviations for multiple resources in one go, you do this in the "Manage Calendar Exceptions" dialog. The deviations specified here will be shown as such in the Calendar View. You can access this dialog with the icon shown above. Select the resource to which you want to make changes from the drop-down list. If you want the changes to apply to all resources, click the "Select all" icon. Specify the date (same start and end date) or the timespan (different start and end date) for which you want to define the deviation from the standard calendar. Enter the new times or leave them blank if you want to define a non-working time for that period.